Are You Being Fast AND Productive or Just Fast? When someone asks if you’re being as productive as you can as an Expert Author, you may be quick to answer, “of course!” However, if you really analyze your situation and think about your daily routine, it’s likely you’ll find areas that can be tweaked to increase your productivity level. Many times we don’t realize how much time we waste because of distractions, disorganization, or lack of direction. Though we may feel as if we’re working at a fast pace, it’s possible we’re holding ourselves back by losing our focus along the way. In order to ensure you’re making the most of your time, we challenge you to re-visit the areas that may hinder your level of production. 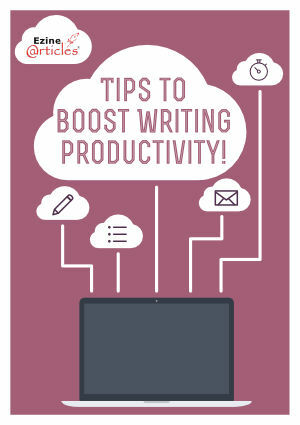 Have a look at our tips below on how authors can boost productivity to keep up with those who make it look easy. 1. Set Clear Goals & Stick to Them. Our number one tip to boost productivity should come as no surprise. Diving right into a project without proper planning and clear objectives will end in mediocre results. First, you need to set goals that are achievable; you need to envision your final product right away, not when it’s near completion. The tips in this blog will help you stay productive and stick to your goals. Most parents give daily chores and responsibilities to their children. In the same light, many authors take advantage of outsourcing tasks in their business. Think about your work; are you doing everything on your own? Similar to setting goals, try writing down all of the daily or weekly tasks involved in your business. Organize them by importance, and when you’re done, you should see a nice list of tasks you can either do away with or delegate to others. 3. Stop Multitasking All Day. There are days when we feel like we can do everything at once without consequences. Even if you manage to accomplish your goals for the day, if you’re constantly going back and forth between tasks, you’re losing time in the transition. You can also lose ideas in the process! The more focused you are on a single task, the less time it will take to finish. 4. Save it for Later. You finally have time to work on an urgent project, but come across an interesting article or social media thread that grabs your attention. Instead of saving it for later, you read or investigate it immediately. This is wrong! In order to stay focused, you need to save these distractions for later. They will only lead to more reading, commenting, sharing and lost productivity. There are many great tools to save content to read at a later time. For example, you can use the bookmark tool in your Internet browser; or if you’re on Facebook, there’s an option to save posts for later by clicking the down arrow to the right side of the post. When you’re working on an important writing piece, you need to prioritize comfort and make the best use of your surroundings. A clean workspace and proper lighting is key! Keep windows to your back to avoid outside distraction. Take a moment to read Creating a Healthy Article Writing Environment for more information to improve your workspace. 6. Set Time Limits on Meetings. Casual group meetings can be a calming change of pace, but they can also dramatically hinder progress. If you’re in charge of the meeting, set a time limit; better yet, show a visible stopwatch for all to see. You need to be ruthless in managing this gut-wrenching productivity drain so it doesn’t get out of hand. Instead of having weekly meetings, have them twice a month and cover more ground at a faster pace. Any content not meant for the entire team should be discussed within each department separately. If you think about a problem you’re having with any type of your business, there’s probably an app that will help! There are amazing tools that improve daily office operations such as Evernote that can store and organize your thoughts, information and media. New gadgets, apps and software are popping up everywhere to assist authors with their writing and idea generation. Try out something new once a month, you’ll never know what you’re missing if you don’t actively embrace change and let technology in the door! 8. Set Up Email Rules to Stay Sane. If you’re familiar with the typical office life, then you’re aware of the burden with emails. It doesn’t matter what software you’re using for your email, you need to be an alert master and set up the appropriate rules to automatically filter your emails. Your eyes shouldn’t have to glance over at every piece of junk mail or question addressed to a different department. Again, let technology ease some of your frustration by blocking out irrelevant content that will break your rhythm. Being a team player is a valuable trait in any business. However, saying “yes” to everything to help out a friend or co-worker is not a long-term strategy. Learn to say “no” when the task could put more stress on your own progress. Make the other person(s) aware of your deadlines and they will respect your boundaries and let you continue being productive. Be nice about it! Smile and suggest an alternative route for them to pursue. 10. BONUS Tip! Turn Off the TV and Your Gadgets. For a humorous slant on eliminating distractions, check out 10 Distractions that Destroy Productivity: The WRONG Advice. We challenge you to figure out your own writing tempo and the goals you want to create. It doesn’t matter if you’re in the planning stages of your next writing series or are finalizing the end product. Think about where you can improve your productivity and what tasks you can leave behind you in your path to success. Do you have any tips to boost productivity? Share in the comments below! After being on FaceBook for 1+ years, I am starting to stay away from reading my timeline – even unfollowing some of my connections, though still keeping them as friends. I find reading the threads a BIG time waster (and a distraction to my writing), as 90% are useless snippets. Now I am finding many should first invest their time accomplishing something great – then you can share with us on FB. Think you for the advice on Productivity and I will take note. Once again write note on Evernote :) haha. I really agree with you Courtney, the digital world changed our life (like Evernote). Useful reminder ; not only for authors but to enhance the value of life. Awesome advice. Number 9 especially; it reminds me of the Nash Equilibrium (popularized version of it, anyway): “the group functions best when each agent does what’s best for himself AND the group.” Being either selfish, or a doormat, does no one any good. You are absolutely correct. Thanks for taking the suggestion a step further and considering how the group as a whole is affected in such situations! This just points out that I *really* need to learn how to plan my books. Writing on the fly really slows me down. But I can’t seem to make my brain work that way. It’s not so much that if I know what’s going to happen I lose interest. It’s that I can’t seem to *learn* how to plan. Any good suggestions for that? I’ve read a lot of books on how to plot a book, but it’s sort of like playing tennis — I can study all the technique I like, but when those balls start heading towards me, all I can do is flail about doing the best I can not to be hit. It takes dedication and discipline if you want to plan ahead without writing on the fly. Comparing it to the tennis analogy, you can either practice or play a match when you feel compelled to play, or you can schedule time to practice and play on a regular basis. Chances are you’ll become a better tennis player who is more refined in their skills if you schedule your time on the court. Thank you for this. Your system of working from scene to scene is excellent. I start a book that way but haven’t continued the same way. It just never occurred to me. This is awesome advice for those people who want productivity in business. thank you and this is very useful post for every person. keeping ourselves motivated and focused is a tough task but it pays in the end. it’s always better to accomplish the day’s goal first and reward us with ‘net’ incentives later. Stop Multitasking All Day – You really explained this point here, the most read part by me. Thanks for sharing useful points. It is very helpful to me. TV is not just productivity killer but it is creativity killer as well. It slows our brain down. And there is scientific evidence that it “zombie-fy” your brain by making it so passive. Also, I make it a point not to write when my wi-fi is on and my emails tabs open. One should write when he is offline, to keep the distraction to minimum. Again thanks for this awesome article to improve productivity. I am fully agreed with your all points but especially your point 3: stop multitasking. I will take care of all points. One of the best articles I’ve seen on productivity, another tip might be taking a break every hour. Nice article … very useful information. I love to share your blog post on my social account. Your post is very helpful and your writing style is really awesome. Thanks for providing this great informative content because we cannot found this type of content very easily. Once again thanks for your efforts. I’ve seen on productivity, another tip might be taking a break every hour. Really great information you have shared, you have explained each and every step. Very useful information. One of the best articles I’ve seen on productivity.